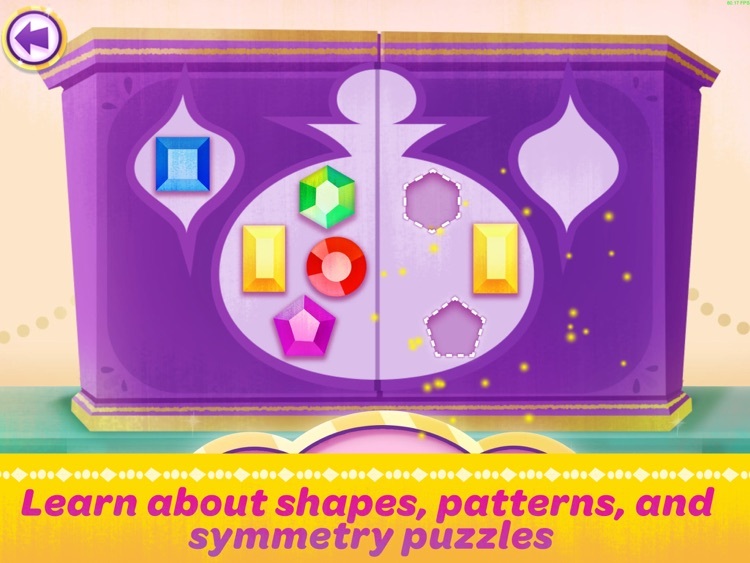 Preschoolers learn basic math concepts on an enchanted carpet ride with Nick Jr.’s mega-popular magic genies, Shimmer and Shine! Help these genies-in-training practice a little genie magic – all while learning problem solving skills approved by Pre-K educational experts! Kids fly through four magical locations in Zahramay Falls, collecting genie coins and finding hidden treasure chests along the way. 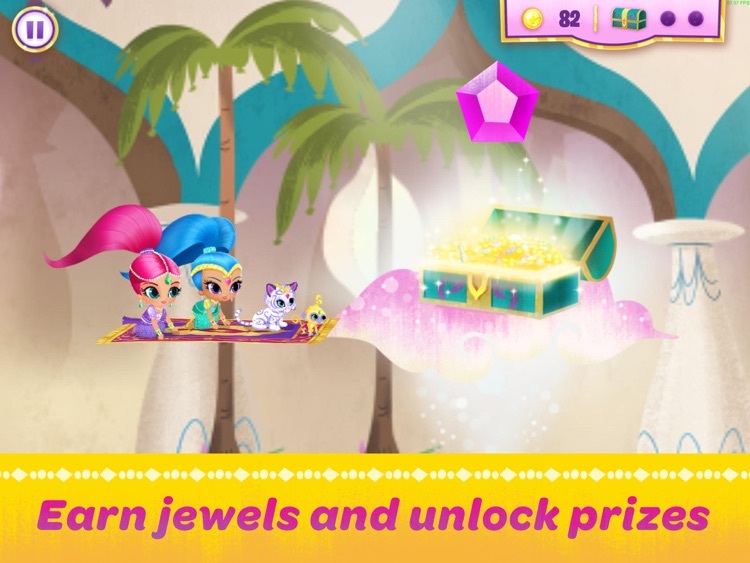 Collect all the genie jewels to open a jewelry box and reveal a special prize! Boom Zahramay! Let’s fly up and away! 1. Strengthens children’s understanding of shapes through consistent verbal and visual references. 2. 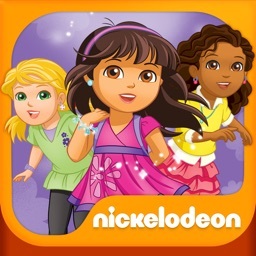 Develops children’s ability to recognize patterns and use deductive reasoning. 3. 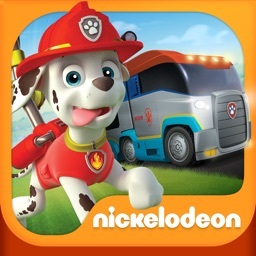 Encourages children to practice their observation and problem-solving skills. 4. Curriculum developed and reviewed by a preschool education expert! 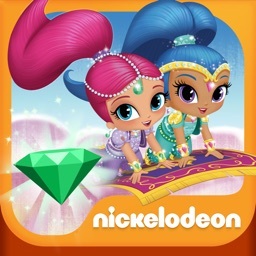 Kids can join Shimmer and Shine as they move their magic carpet up and down through four magical Zahramay Fall locations: Genie Beach, Genie Bazaar, Zahramay Falls city, and the Hanging Star Gardens. 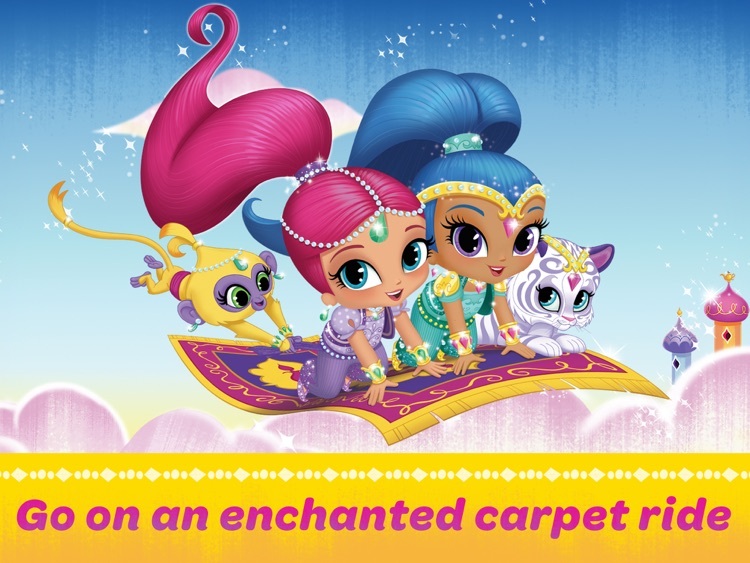 In every magic carpet ride, kids must avoid obstacles and open blocked doors, all with a little swipe of genie magic! 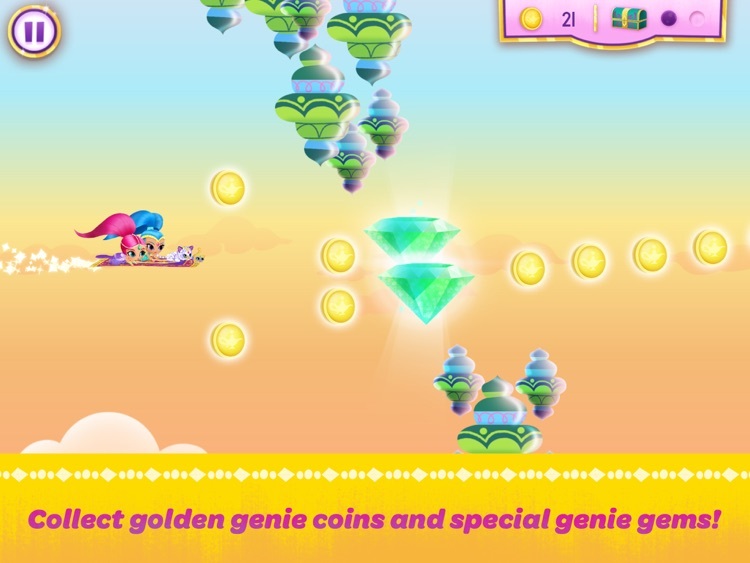 Each level provides room for exploration and discovery as the player searches for all the hidden treasure chests and unlocks them to get their genie jewels. Children develop matching skills with eight geometric shapes including rectangles, pentagons, hexagons and trapezoids. 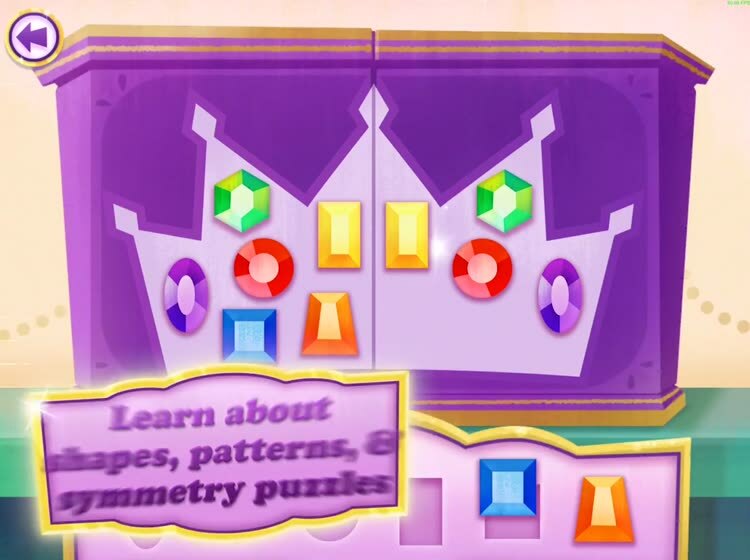 Jewelry box puzzles allow children to use problem-solving strategies and deductive reasoning to create symmetrical patterns which get increasingly more difficult as they play on! 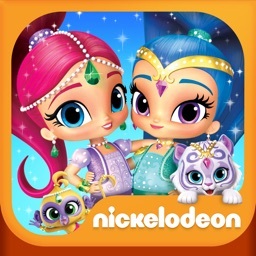 Kids can complete each level and earn fifty unique genie prizes. 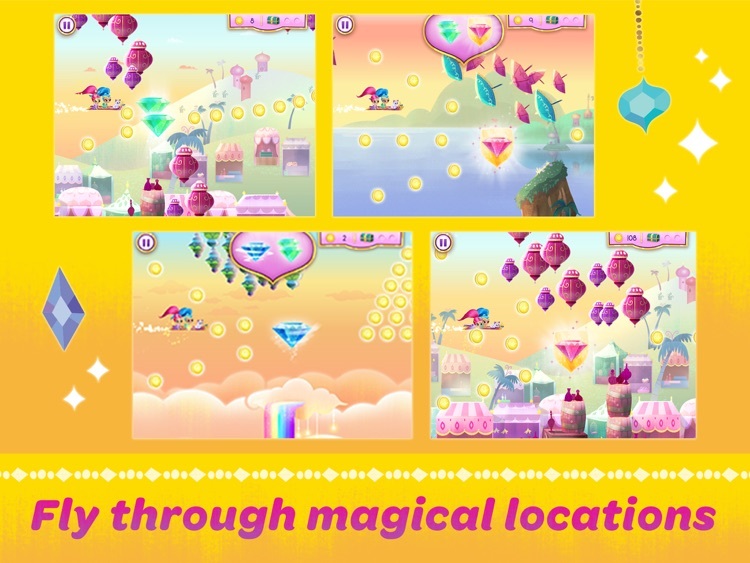 The flying is endless and the puzzles can be completed again and again. 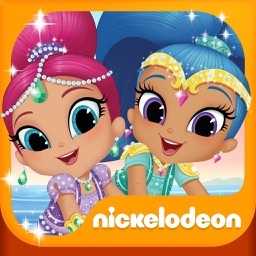 For users residing in the EU, Shimmer and Shine: Enchanted Carpet Ride Game iPad may include the use of persistent identifiers for game management purposes and installation of this app constitutes your permission to such usage of persistent identifiers for all users on your device.